When Arjen Robben was signed at the beginning of last season pundits across the world immediately put their brains to work to come up with a moniker for what was to be one of Europe’s best wing pairings. “Robbery” emerged in numerous publications and on the lips of commentators world wide but rarely ever where it really counted. Because of their reoccurring injuries the game against Hoffenheim was the first time both Ribery and Robben started in 9 months. Their return to the line up saw Schweinsteiger moved back to his preferred central midfield position while former Hoffenheim player Gustavo continued at left back. That aside, Van Gaal proceeded with the same formation that stumbled in Cologne a week ago. Meanwhile, Hoffenheim are still trying to move on from Ragnick’s departure. One loss in the last 9 matches prior to this could be a bit misleading. 5 of those were draws and only the win at Frankfurt in November was convincing. They picked up their form in the new year, winning the last two matches, neither being very convincing though or reminiscent of the style Hoffenheim are often lauded for. Pezzaiuoli lined up with his preferred 4-3-3 with Vukcevic coming in for Sirgurdsson. Bayern attacked from the get go and immediately put Hoffenheim under the knife. Müller played an incisive through ball to Robben who set up Gomez 17th league goal this season with just a minute gone. The scintillating play involved 9 Bayern players and 23 consecutive touches, a glaring example of what this Bayern side is capable of when focused. The relentless pressure continued and Hoffenheim, now almost completely pinned back, gave the ball away near their own box to their own detriment. Müller immediately pounced on it and slotted the ball into the near post. Hoffenheim coach Pezzaiuoli withdrew Rudy after 20 minutes and put in the more combative Weis. Rudy was originally a wide player recently converted into a central midfielder and found it hard to cope with Bayern’s consistent waves of attack. Weis is the closest the Bundesliga has to a Gattuso and was probably seen as the ideal player to ease the pressure and level the playing field. Hoffenheim found their footing more in the next 20 minutes but Bayern were too disciplined to allow their opponents to capitalize on any of their created chances. Müller admitted after last week’s collapse against Koeln that the team took their foot off the pedal at half time and essentially invited their opponent back into the game. That type of complacency and lack of discipline has been plaguing Bayern more than it should over the last couple of seasons. This time around they made it a point to maintain the pressure and tempo of the first half. Van Gaal’s side maintained the pressure and got their third when Lahm picked up the ball in midfield and laid it off to Robben who proceeded with a trademark cut inside past 5 Hoffenheim players to slot it into the bottom right corner. Few defenders are able to deal with Robben’s pace despite his rather predictable cutting in from the right. Bayern’s 4th and final goal came under similar circumstances again when Robben picked up the ball on the right and released a sublime shot into the top corner from 15 meters out. Hoffenheim were on the back-foot throughout much of the game and their midfield struggled to deal with Bayern’s relentless pressure. Ribery (7) and Robben (10) were everywhere, key to Bayern's gameplan. Much has been said about Bayern’s erratic form and performances this season. A lot of blame has been directed at Louis van Gaal for his positional changes but the truth is that Bayern have faced some of the worst injury problems in recent memory. As a result Van Gaal was forced to readjust and come up with alternate plans to fill the gaps. Ribery and Robben are the primary creative conduits on the team. Most attacks go directly through them and their high tempo pressing game relies very much on the dynamism of the two wingers. Their absence created a vacuum up the field that reverberated throughout the team. It put more pressure on the midifeld and as a result on their defense. Bayern also lacked creativity up top and as a result, Van Gaal moved Schweinsteiger further up the pitch. With Ribery and Robben on the field Bayern’s play is more diverse, creative and unpredictable. Hoffenheim were busy tracking Robben and Ribery so much so that players like Müller, Gustavo, Schweinsteiger and Pranjic were very comfortable getting forward and had plenty of space to operate in. Beck and Ibertsberger, attacking in nature, rarely got out of their own half due to marking duties. As a result, Bayern’s play was not focused in one area of the pitch but spread out quite evenly across it and that in large part was down to Ribery and Robben’s constant running at Hoffenheim players. In addition, Ribery and Robben were consistent link up hubs for the rest of their teammates. Ribery and Robben had amongst the most touches of any players on the field and combined with every single player on the pitch. Bayern's attack is more evenly spread out with Ribery and Robben on the pitch. Van Gaal noted the importance of the pair after the match, “They are incredibly important for Bayern Munich, as Messi and Xavi are for Barcelona, or Ronaldo and Ozil for Real Madrid,” He also underlined the tactical difference the two wingers make to the team, “With Robben and Ribery, we have more creativity going forwards. We have had to wait six months for them to be back.” Suffice it to say, Bayern are a different side when the two players are on the pitch and it was very much on display against Hoffenheim. Bayern had less possession but were more effective. Apart from Barcelona no team had more possession of the ball than Bayern last year. That possession-based game continued into this season and very rarely is Bayern ever outplayed in this category. Bayern have even been criticized for dwelling on the ball longer than they should, keeping possession for possession’s sake rather than to create chances. This time around however Bayern were a lot more direct and got forward as soon as they won the ball instead of lingering. It is interesting to note that 3 of Bayern’s 4 goals came when Hoffenheim had more possession. Also curious is the fact that Bayern played less passes than all their previous matches in 2011. Van Gaal clearly instructed the team to be more direct. In addition, this was Bayern’s lowest passing completion % since the second half of the season began. Despite these statistical discrepancies Bayern achieved arguably their most impressive win of the season. Bayern's pass % completion and overall passes were less than in previous matches. Part of this may be explained by the need to create goal-scoring chances so as to not be vulnerable for the remainder of the games as they have been many times this season. It might also have been an instruction based on Hoffenheim’s style of play. Similar to Bayern, Hoffenheim are a direct attacking team who like to get forward and often expose themselves defensively as a result. Van Gaal may have wanted to capitalize on that tendency and by telling his players to be quicker in the transition he achieved just that. Müller's ball distribution, spread out and involved. Few players in Europe have been in better form in 2011 than Thomas Müller. Müller has either scored or set up a team mate in the last 8 matches and has been involved in nearly every goal Bayern scores. Whether he plays on the right, left or in the center Müller’s sense of positioning and endless energy has become crucial to Bayern’s success. 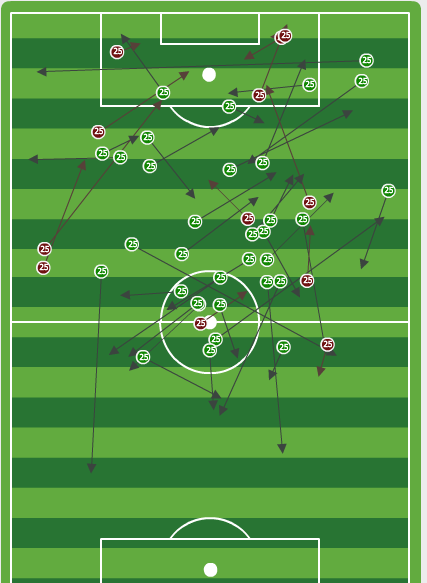 The young German made more passes than any of the 4 attacking players (43) and combined with every player on the pitch aside from Gustavo and Kraft. Both teams are proactive and try to play quick passing attacking football, which is why these matches have always been close since Hoffenheim were promoted. This time around however Hoffenheim had no answer a fluid and determined Bayern side that welcomed back one of the best wing pairings in Europe. Bayern are back to 3rd place after this weekend’s results and on course for their desired Champions League spot.